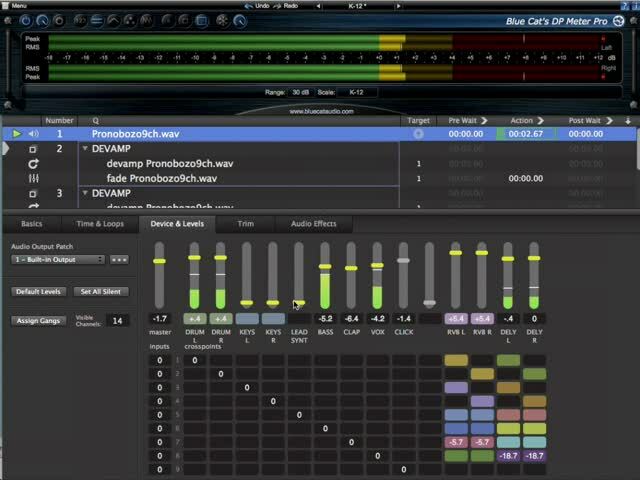 Although most audio files that are used in QLab are Mono or Stereo, QLab can actually handle files with up to 24 channels. This means that multi-track files can be used in QLab and mixed down directly to stereo (or other formats) using the device and levels tab in the inspector. The main advantage in doing this is that start and end times, loops and devamps, can be set for all the tracks at once, instead of having to set each stereo or mono file individually which is the case if the individual tracks are just put inside a ‘fire all children’ group. Sometimes you may want every individual track available but, generally, it is easier to premix stems in the DAW, e.g Drums(L+R), Chorus Vocals etc. and just balance these pre-made sub-mixes within QLab. First of all, we have to prepare the multi-track audio file. From our DAW we export all the component tracks as mono files (unless the DAW is capable of exporting a multi-track audio file). We then need some software to combine the individual mono files into a multitrack audio file. On the left is the folder with our individual mono files. These are dragged into the SoundFilesMerger window on the right. We then select the output file format and resolution and hit merge. We can then add the merged file to our QLab workspace. You can see that the file has 9 channels and the cross points have been set to the 1-1 default setting. The cue outputs have been named according to the track contents. The stereo pairs, like Drums L +R, are ganged (indicated by the colored backgrounds) and the reverb sends are also ganged. In order to set this up, and also to enable all the tracks to be mixed to a single stereo output we need to utilize several set-up screens, accessed by pressing the gear wheel in the bottom right corner of QLab. Here we can name all the cue outputs, so the names appear in the Device and Levels Tab of the audio cue. We insert a 2 channel reverb on Cue Outputs 11+12. (I have used the Apple AUMatrixReverb which should be available on all Mac OS that will run QLab 3) and a delay on Cue Outputs 13+14. We then open the Device Routing tab. Here we have matrixed the 14 cue outputs to device outputs 1+2. i.e we are matrixing the 14 cue outputs to a stereo mix. You will also notice that cue output 9 (CLICK) is not matrixed to stereo, but instead to device output 3 (You won’t see this unless you have an output device with more than 2 outputs). Device output 3 can then feed a pair of headphones for the conductor. In the example, you will notice I have an output meter for Device Output’s 1+2. This is inserted as a 2ch device on the Device Outputs. As there is no suitable meter included in core audio I have deleted it in the downloadable workspace, so if you want metering you will have to add your own. Returning to the Device and Level tab of the audio cue we can set up the gangs. Gangs are set for the stereo stems (Drums and Keyboards) and for the Reverb and Delay L+R Sends. Gangs are also set for the cross points that will allow the inputs to be set to the reverb and delay sends. For stereo stems, they are set so that the odd-numbered track goes to the left send and the even to the right. For mono tracks, the gang means that the track is sent to L+R. In the Time and Loops Tab, the audio file is sliced. The first and second slices have infinite loops set, that will de-loop and continue to the next slice when devamp cues are fired. The devamps also trigger level change cues which change the mix at the slice transitions. There are 4 beats of click in (which you will only hear if you have an output connected to device output 3) with some introductory audio after the third beat.